Off Wellman Way: St. Patrick's and St. Baldrick's Day--Again? "Members of the Santa Paula Fire and Police departments learned when they gave their all - at least all on their heads - at Sunday’s St. Baldrick’s Foundation Conquer Kids Cancer Shave Off." The day was changed to Sunday to have more participants, but it's the St. Patrick's Day giving and so many came to support the cause. My husband and son were both on duty on Sunday. My boys are Captains and were missing the camaraderie that goes with the "fun" of going bald for a cause. 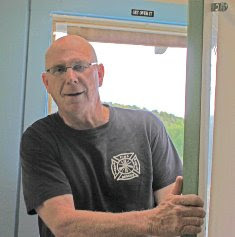 Peggy Kelly, our favorite newspaper writer at the Santa Paula Times Weekly Newspaper, wrote about St. Baldrick's Day Fundraising Event, "Santa Paula Fire Department Capt. Steve Lazenby said although there were firefighters participating at the event in Ventura, others, “about five or six of us that couldn’t go, had our heads shaved anyway” at Station 81. Handling the shears was SPFD Engineer Carlos Arana: “He did not allow his head to be shaved, but he did do us,” an act Lazenby said was to show support for St. Baldrick’s in “solidarity” with firefighters at the event. The Santa Paula Firefighters Association donated $500, and Firefighter Reserve Arturo Casillas raised “$1,270 by himself, and even he couldn’t go, had other obligations,” but came by the station to have his head shaved. Lazenby said he looks forward to participating again next year: 'It irritates my wife enough that I’ll do it!'" Okay, Yes, I need to get over it. It's taking longer each time he shaves his head for my dear husband's hair to grow back. Or....just a thought, ummm... just came to me. Does he shave it a little more after the event? My older daughter even did that! Yes, she's a lot like her dad. She went "Bald For Books" and filled the brand new Monte Vista Library by sacrificing all her hair. 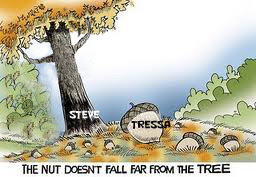 "The nut doesn't fall far from the tree!" Tressa raised a lot of money. The Sespe Sun, Fillmore's newspaper really covered the event. 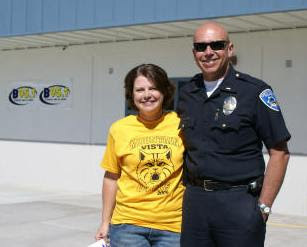 They said, "Teacher Tressa Saviers and husband Santa Paula Police LT. M. Saviers are together just before her hair is shaved after the students at Mountain Vista School for raising and exceeding their $8,000 goal which will go for books for the school's library. At last count the amount raised will top $18,000." And yes, she raised even more when the new housing development kicked-in, also. "Tressa Saviers really gets a hair cut in the quad at the Mountain Vista Elementary School. As her hair was cut the students cheered her on" Yes, she went bald for a worthy and sweet cause, just like her dad does. "If I'm bald, you are going there, too." 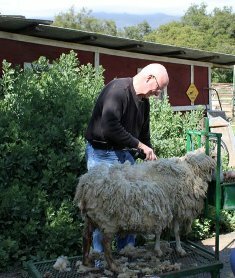 This was just after the "Big Shave" and he just wasn't "OVER IT" Soooo, he got the clippers and started in on the Finnsheep. So much for my beautiful and coveted, long fiber stands to spin this year. I need a new hobby? I guess some felting and I really need to figure this all out. Now where is Martha Stewart? I think I quit watching the show when she offered to "reuse" goat dropping by stringing them and using gold spray paint made enough garland to swag her whole barn.